The Confederation of Tourism and Hospitality (CTH) is proud to announce the official conferment of Dr. Wai Mun Lim as a CTH Fellow. 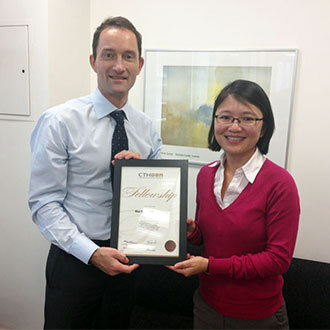 CTH Fellowship is awarded at the discretion of CTH to those who have achieved positions of significant responsibility in the industry or who have made notable contributions to the work of the Confederation. This is the CTH's ultimate accolade and it is only awarded on third party recommendation and after careful consideration by the CTH board. Dr. Wai Mun Lim is Associate Professor of Service Management at Plymouth University. She was awarded a Teaching Fellowship and nominated as an AIM Associate (Advanced Institute of Management) in 2010. Prior to her embarking on an academic career, she was a tour operator in Singapore for many years. She publishes widely in the area of technology adoption within the tourism and hospitality industry and has won grants investigating the use of technology in small and medium sized enterprises. Her expertise in the adoption of Web 1 and 2 technologies has also won her various consulting projects with private companies ranging from art design firms to global hotel chains. Her current research interests are in the use of information technology in developing countries, internet technologies for distribution and marketing and how businesses co-create value with customers via technology. Her pedagogic research includes exploring how academics co-create value with businesses via curriculum. She currently lectures in: Managing Service Innovation; Business Strategy and Finance; and e-Service Strategies.